Make this incredible creamy vegan hot chocolate in your high-speed blender in less than 5 minutes. If you’re using a conventional blender, gently warm on the stove top. 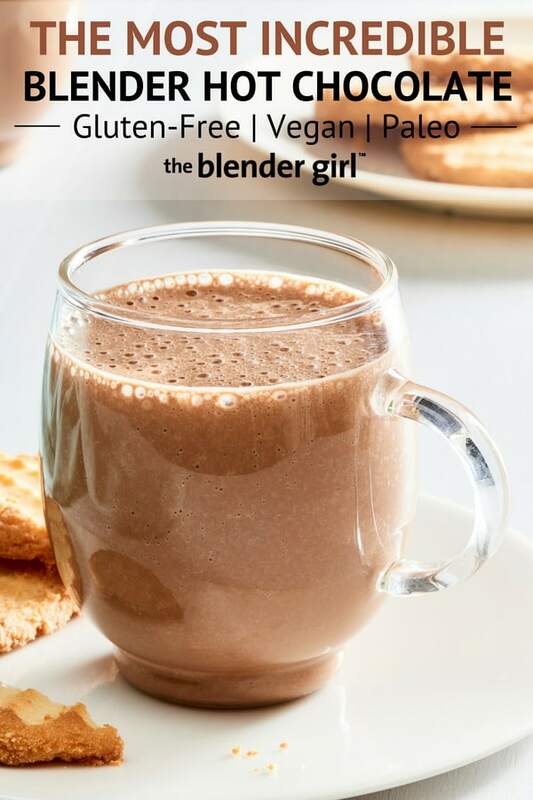 You can make easy vegan hot chocolate in your high-speed blender that is so rich and creamy, you’d never know it was dairy-free, gluten-free, and paleo-friendly. I love hot chocolate in the winter. And, with chocolate, the richer the better. And, I like my hot chocolate really really creamy like a latte. I always use raw cashews to make my hot chocolate because they get so creamy, and I either blend them with filtered water, or with almond or coconut milk. 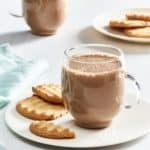 With this recipe, I’m using water to make it easier, and you can sweeten the hot chocolate with dates or maple syrup. I prefer using dates as the flavor is more well-rounded and balanced. I also like an accent flavor with my chocolate. So, I’ve listed my two favorite boosters – cinnamon or red pepper flakes. But, peppermint extract or orange extract is also popular in our house. For me, the easiest and best way to make hot chocolate is in a high-speed blender. That way, you just throw all of the ingredients in, and let the machine heat and froth the milk. 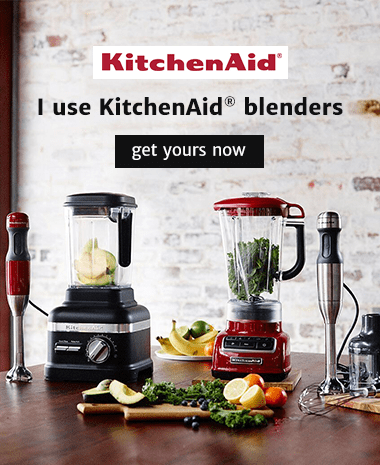 And, because the KitchenAid® Pro Line® Series blender is the most powerful home blender and has a dual-wall thermal control jar (that is insulated) it heats the hot chocolate in about half the time of other high-speed blenders, so I get my fix even quicker. For those of you who don’t have a high-speed blender yet, just throw the ingredients into your conventional blender for about 60 seconds until smooth and creamy. Then transfer the mixture to a small saucepan, and warm it over medium-low for 1 to 2 minutes until piping hot. Many of you have written to me over the years complaining about how unattractive many of the high-speed blenders are. I hear you! I’m also very particular about my aesthetics, and I like to match my appliances to the style of other things in my kitchen. I love that I’ve got a blender to match my KitchenAid® stand mixer, food processor, kettle, toaster, and coffee maker. Check out the KitchenAid® Pro Line® Series range. Now, that’s a holiday gift! But, back to the hot chocolate. Don’t miss it. It is seriously delicious, and such an incredible easy treat for the holidays. Looking for other hot drinks made in a high-speed blender? You can make easy vegan hot chocolate in your high-speed blender that is so rich and creamy, you'd never know it was dairy-free, gluten-free, and paleo-friendly. Throw all of the ingredients (including any optional boosters) into your KitchenAid® Pro Line® blender. Set the blender to the Adapti-Blend™ soup program. Blend until the machine turns itself off. Alternatively, throw in your high-speed blender for about 5 minutes, starting on speed 1 and gradually increasing to speed 10 until hot. *If you don't have a high-speed blender, blast on high for about 60 seconds in your conventional blender until smooth. Then, transfer the mixture to a saucepan, and gently warm on low until hot. ***If you don't want to use cashews, substitute 2 cups of unsweetened almond milk for the 2 cups water and 1/2 cup cashews.